This sanitary survey form can be used to monitor and evaluate the condition of communal and public toilet blocks in a refugee setting. 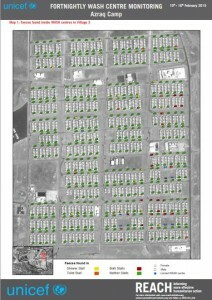 The main purpose of this tool is to rapidly identify public health and protection related risks. The tool can also be used in the medium term to monitor trends in the condition of toilet infrastructure. 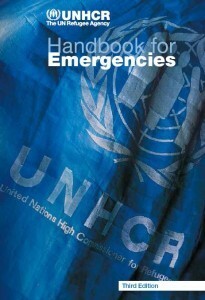 Categories: WASH Emergency Guidelines and WASH Emergency Tools. 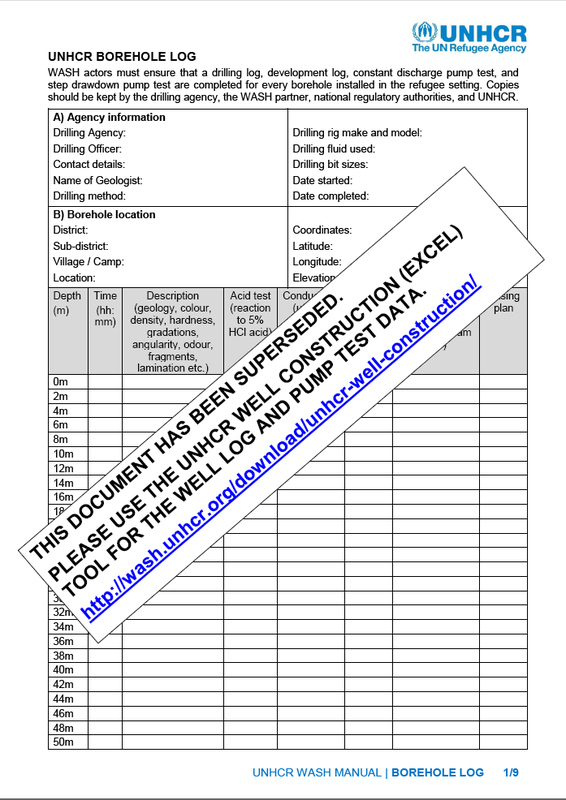 This is the standard UNHCR borehole drilling log and pump test template available in PDF and MSWord formats. WASH actors should ensure that a drilling log, development log, constant discharge pump test, and step drawdown pump test are completed for every borehole installed. 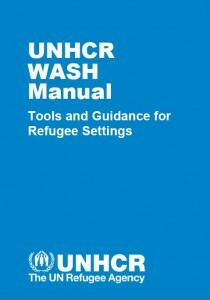 Copies should be kept by the drilling agency, the WASH actor, national regulatory authorities, and UNHCR. Categories: WASH Blank Forms and WASH Blank Forms. 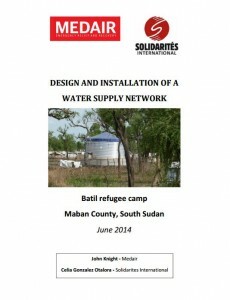 This document provides an overview of the design of the water system in Batil Refugee Camp, S. Sudan. Locations: Africa and Sudan and Chad Special Operational Region. Organisations: Medair and Solidarités International. DatabaseDocTypes: WASH Design Documentation. Tags: Bloody Diarrhoea, Communicable Disease Control, Community Led Total Sanitation (CLTS), Desludging and Excreta Transportation, Excreta / Urine ReUse, Excreta Composting, Hygiene Behaviour Change, Landfill Management, Malaria, Medical Waste Management, Menstruation Hygiene Management, Public Health, Sewerage and Excreta Conveyance, Waste Recycling , Reuse and Reduction, Water Prospection and Investigation, Water Pumping, Water Safety Plans, and Watery Diarrhoea. Locations: Jordan and Middle East. Organisations: REACH. DatabaseDocTypes: WASH Monitoring Reports. Categories: WASH Maps. Tags: Bathing Facilities, Bathing Facilities, Bathing Facilities, Boreholes, Boreholes, Boreholes, Bulk Water Treatment, Bulk Water Treatment, Child Friendly Facilities, Child Friendly Facilities, Communal Toilets, Communal Toilets, Communal Toilets, Communal Toilets, Cross Cutting, Cross Cutting, Disability, Disability, Disease Vector Control, Disease Vector Control, Drainage, Drainage, Drainage, Drilling, Drilling, Drilling, Excreta Management, Excreta Management, Excreta Management, Excreta Management, Excreta Treatment, Excreta Treatment, Gender, Gender, Grey Water Disposal, Grey Water Disposal, Grey Water Disposal, Hand Dug Wells, Hand Dug Wells, Handpumps, Handpumps, Handwashing with Soap, Handwashing with Soap, Handwashing with Soap, Household Toilets, Household Toilets, Household Toilets, Household Water Treatment, Household Water Treatment, Human Right to Water / Sanitation, Human Right to Water / Sanitation, Hygiene Promotion, Hygiene Promotion, Laundering Facilities, Laundering Facilities, Laundering Facilities, Piped Water Networks, Piped Water Networks, Piped Water Networks, Protection, Protection, Rainwater Harvesting, Rainwater Harvesting, Solid Waste Management, Solid Waste Management, Spring Protection, Spring Protection, WASH Assessments, WASH Assessments, WASH Assessments, WASH Assessments, WASH Coordination, WASH Coordination, WASH Coordination, WASH Monitoring, WASH Monitoring, WASH Monitoring, WASH Monitoring, WASH Monitoring, WASH Programme Health and Safety, WASH Programme Health and Safety, WASH Programme Management, WASH Programme Management, Water Quality Testing and Surveillance, Water Quality Testing and Surveillance, Water Storage, Water Storage, Water Supply, Water Supply, Water Supply, Water Supply, Water Tankering, and Water Tankering. Languages: English, English, English, English, English, and English. Organisations: UNHCR, UNHCR, UNHCR, and UNHCR.